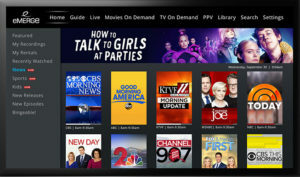 eMERGE integrates pay-TV operators’ IP video services, enabled by eVUE-TV, including live linear, video-on-demand, pay-per-view and network DVR recordings, with OTT streaming content. It allows operators the tools to modify and customise categories, campaigns and featured content; and, they can upgrade their user interface and experience with advanced trick-play features like catch-up and start-over viewing. Also, with functionalities like deep linking and universal search, consumers can navigate and browse the content they’re looking to watch without ever having to leave the eMERGE app. eMERGE is available on operator managed set-top boxes, like Evolution Digital’s eSTREAM 4K, powered by Android TV , as well as retail devices including Roku, Apple TV, iOS and Android mobile. More compatible devices will begin rolling out in the coming months, the company said.